On the stand Monday, [Jason] Posey told the jury he had previously pleaded guilty to wire fraud, mail fraud and money laundering. Both [Thomas] Dodd and Posey knew Stockman through his work with the conservative Leadership Institute, an Arlington nonprofit that trains youth in grassroots organizing. Posey, 47, who now works as a fry cook at Spuds in Tupelo, Miss., said he worked for Stockman on-and-off since his unsuccessful bid for re-election to the U.S. House of Representatives in 1996. He helped with Stockman’s failed campaign for Texas Railroad Commissioner in 1998 and lived among other volunteers in Stockman’s ramshackle campaign headquarters, a former motorcycle repair shop in Webster, during Stockman’s victorious 2012 campaign for the Congress. 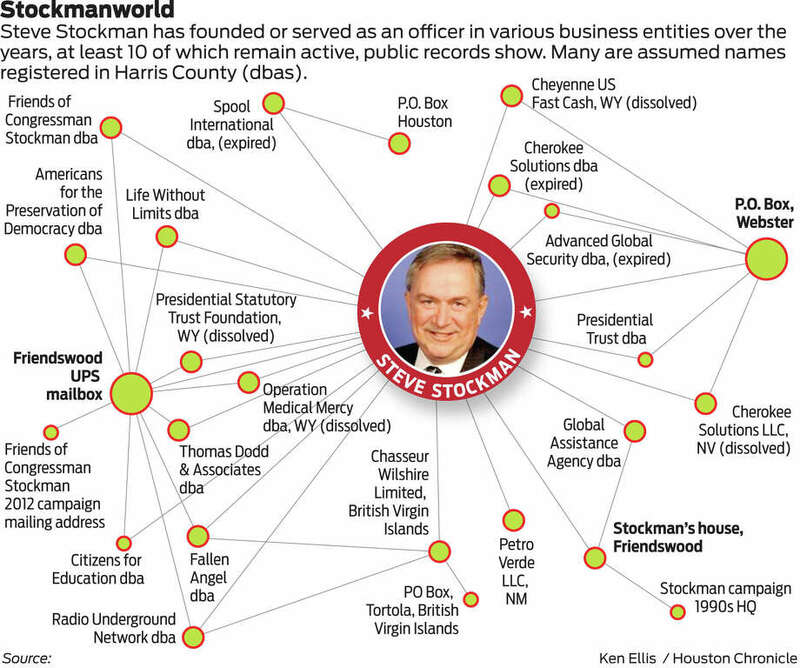 Stockman then tapped him to be a congressional staffer in Washington. But when new employees were going around the room introducing themselves by their new titles at a preliminary staff meeting, Posey did not mention that he would be a liaison working on special projects. He told the jury he knew nothing about Stockman’s major donors, although he helped the ex-congressman set up a failed charity, which Stockman later used to solicit donations, according to testimony from other witnesses. After two and a half years dodging federal investigators by fleeing to Egypt, former congressional aide Jason Posey came to the painful realization that his boss, two-time Republican congressman Steve Stockman, was going to blame him for the elaborate fraud scheme they had orchestrated, he told a federal jury Tuesday. That pledge, according to Posey, was that if their questionable use of charitable donations came to light Stockman “would come clean about everything” and protect him and another devoted congressional staffer. During Stockman’s successful 2012 campaign for the House of Representatives and his failed 2014 bid to unseat Texas Republican John Cornyn for Senate, Posey said he helped filter charitable donations to conservative 501c3 nonprofit groups. Posey testified he helped Stockman set up sham charities and associated bank accounts, which Stockman directed him to use to pay off campaign expenses and personal debts. He wrote checks, set up bank accounts and moved the money, as Stockman told him, into shadowy charities, including one called the Egyptian American Friendship Society and another entitled Life Without Limits, supposedly dedicated to helping people recover from trauma, so the spending would look like it was coming from charitable groups, according to his testimony. You really have to admire the dedication to these schemes. There’s no length Stockman (allaegedly) wouldn’t go to for the money. Imagine how much he could have gotten done if he’d applied that kind of work ethic to something productive. And finally, from Wednesday, when the prosecution finished and the defense got started. The prosecution ended its case by calling back to the stand FBI Special Agent Leanna Saler, to explain to the jury how Stockman used Bitcoin to forward funds to Posey who had fled to Egypt to avoid investigators and the purchases of so-called “burner phones” which were used to discuss an improper campaign donation, according to Posey’s testimony. Both were difficult for law enforcement to trace, Saler testified. Defense lawyer Sean Buckley asked whether the Bitcoin transactions were charged in Stockman’s indictment. Saler said no. The ATM withdrawals Stockman made in Switzerland and Cairo were also not included in the charges, she testified. Under further questioning from Buckley, the agent stated that the FBI never investigated the two mega-donors who gave Stockman the charitable contributions that were later diverted to pay personal and campaign editors. After the government ended its presentation, Stockman’s lawyers called Callie Beck as their first witness to begin their defense of the charges. The court adjourned shortly after Beck’s testimony to await the expected arrival of another witness who Stockman’s lawyers said was flying in from the Republic of Congo to testify about the GOP lawmakers work shipping medicine to developing countries. Beck was on the stand less than 10 minutes in all, detailing what she did during a summer program Stockman paid for with a charitable donation. She said the Summit, a two-week camp in Colorado run by a Christian organization, involved lectures and team building for youths before entering college. Under cross examination by Assistant U.S. Attorney Melissa Annis, Beck acknowledged she was not familiar with Freedom House, a housing and training program for Capitol Hill interns. Yes of course I blogged about it when Stockman announced he would accept Bitcoin for his campaign. I mean, come on. The defense is expected to take just a couple of days, with the case wrapping up early next week. I can’t wait to see what this other witness has to say. Posted in: Crime and Punishment, Scandalized!.